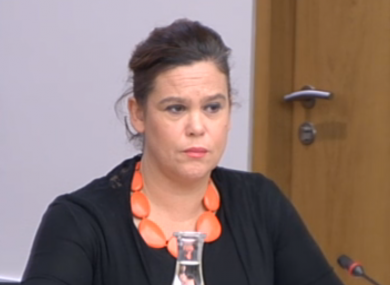 MARY LOU MCDONALD has said she doesn’t regret naming the former ministers and TDs mentioned in the tax evasion dossier compiled by whistleblower and civil servant Gerry Ryan. Using her parliamentary privilege, Sinn Féin’s deputy leader read into the Dáil record the names of six former politicians against whom allegations of tax evasion have been made. Several of those named have strenuously denied any wrongdoing. McDonald has since been criticised by some of her colleagues on the Public Accounts Committee. At this morning’s PAC meeting, Fine Gael TD John Deasy accused McDonald of using the body for “political ends”. “You’ve been doing it for a while and you need to stop because you’re actually affecting the workings of this committee, which actually is important the public and the people you actually represent in your constituency. And you’re damaging it,” he said. But McDonald said Deasy’s claims were “a nonsense” and the committee would have only been able to look at the Ansbacher allegations within “narrow confines”. “I was fully entitled to make as a member of the Oireachtas on the Dail floor yesterday and in the final analysis, Deputy Deasy, I am answerable to those who elect me for the utterances I make rather than, with all due respect, to a Fine Gail member of this committee,” she said. Yesterday, Labour’s Robert Dowds accused her of “reckless political grandstanding”, describing her actions yesterday as a “cheap political stunt that serves no purpose other than grabbing headlines”. Meanwhile, Joe Costello questioned her suitability to remain on the committee. It should not have been done. McGuinness: Names being made public doesn't give people the confidence to come forward, they must be given scope to defend their good name. However, McDonald told Newstalk Breakfast she felt obliged to name names as Ryan had highlighted “a pattern of political obstruction” to his findings which led to them “hitting a wall” and “sinking without trace”. Of course those who are named have a perfect right to defend themselves. McDonald said she sought out legal advice before publicly naming the former Ministers and TDs. She again noted that PAC has been told investigating the claims would be beyond its remit and said an Oireachtas or judicial inquiry may be needed to find out what really happened. McDonald said the allegations are “extremely troubling”, adding that Taoiseach Enda Kenny needs to act quickly on the issue and not “just wish it will go away”. Read: Who will investigate tax evasion claims against politicians? Email “Mary Lou told: 'You've been doing it for a while and you need to stop'”. Feedback on “Mary Lou told: 'You've been doing it for a while and you need to stop'”.